To make it safer to cycle during the dark winter months, Bioracer has developed a technology that combines the heat retaining properties of a normal winter fabric with the visibility of reflective safety clothing. What makes these fabrics special is the use of Pixel, a technology that incorporates a matrix of printed reflective glass pearls on our fabrics. We use this technology in our PXL75 and PXL100 winter fabrics which we implement in highly reflective, wind and waterproof jackets for winter riding in dark circumstances. For 2016, we will incorporate this technology in some of our lightweight summer materials for clothing you use during your summer evening rides. This technology provides every team with the opportunity to be able to train and ride safely, and is proven to be a potential life saver. Layer #1 – is a breathable inner layer that wicks moisture away from the body. Layer #2 – the central layer provides a shield against cold, wind and rain. 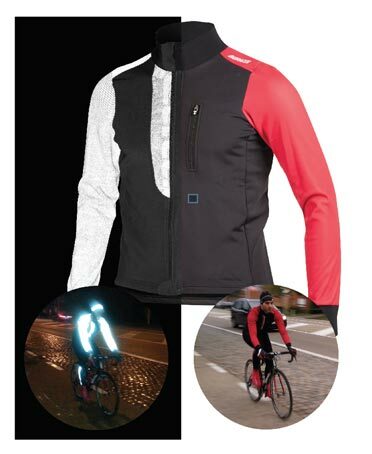 Layer #3 – is the outer layer that uses small dots, or pixels, to provide super reflectivity for maximum visibility in the dark. It can be used in any number of garments from cycling jackets to gilets to bib tights & shorts to arm warmers. Best of all it can be printed on like normal fabric so can be easily combined with custom team-wear.